In my last post I hypothesized that the bear market in stocks had finally sunk its teeth into the precious metals sector. I was looking for a final move down into a true D-wave bottom, coupled with the HUI dropping down to test the 200 week moving average. I could not have been more wrong! Instead gold formed a double bottom at $1600 and yesterday confirmed a trend change to a pattern of higher highs and higher lows. 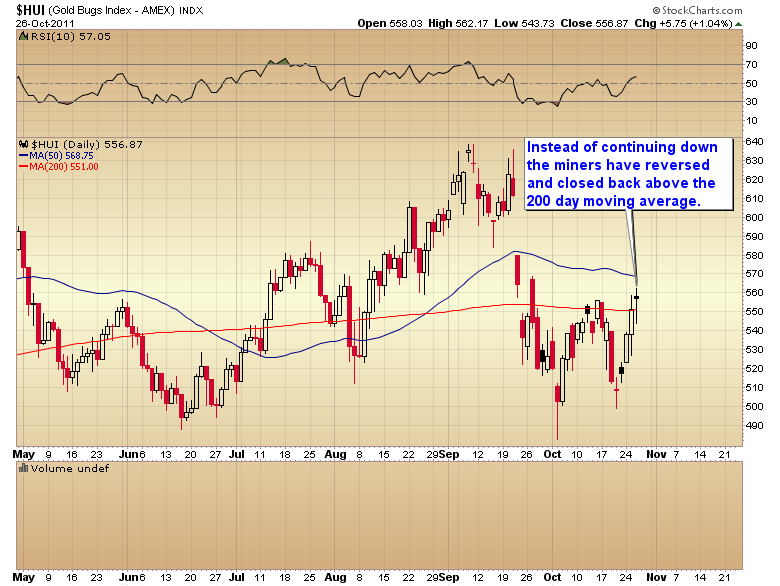 As is usually the case the miners played follow the leader and reversed their downtrend also. 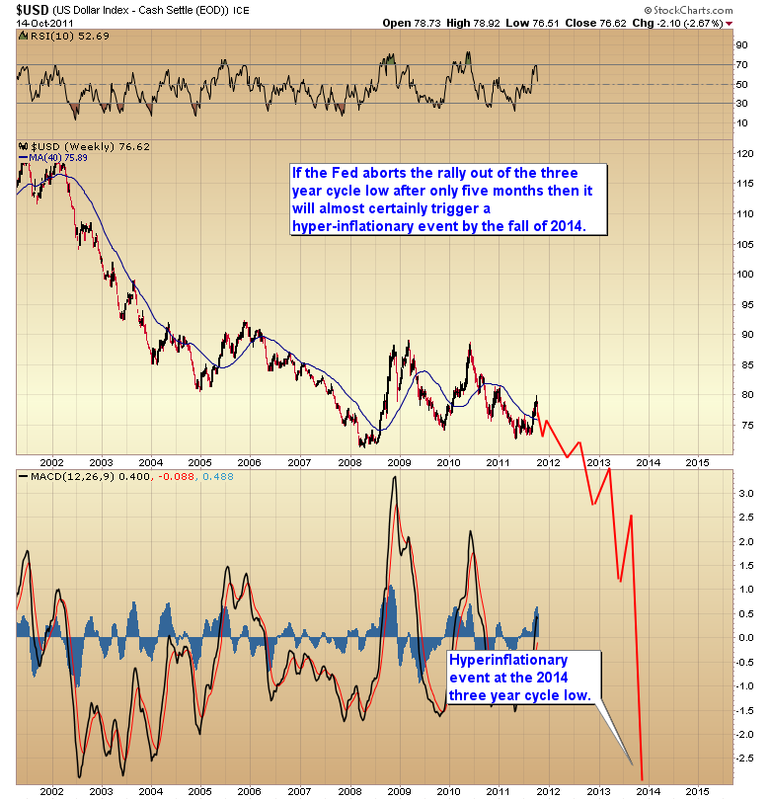 It is now clear that gold put in an intermediate degree bottom on September 26. The double bottom is a much stronger basing pattern then a V-shaped rebound and should launch a test of the $2000 level at some point during this intermediate cycle. This entry was posted in Uncategorized on October 26, 2011 by Gary. This entry was posted in Uncategorized on October 25, 2011 by Gary. Another portfolio change will be made at the open. A portfolio change will be made at the open this morning. This entry was posted in Uncategorized on October 24, 2011 by Gary. This entry was posted in Uncategorized on October 21, 2011 by Gary. At this point I think it’s pretty clear the general stock market is now in the initial phase of a new bear market. It’s trying to generate a bear market rally over the last three weeks, but so far it’s been pretty weak. 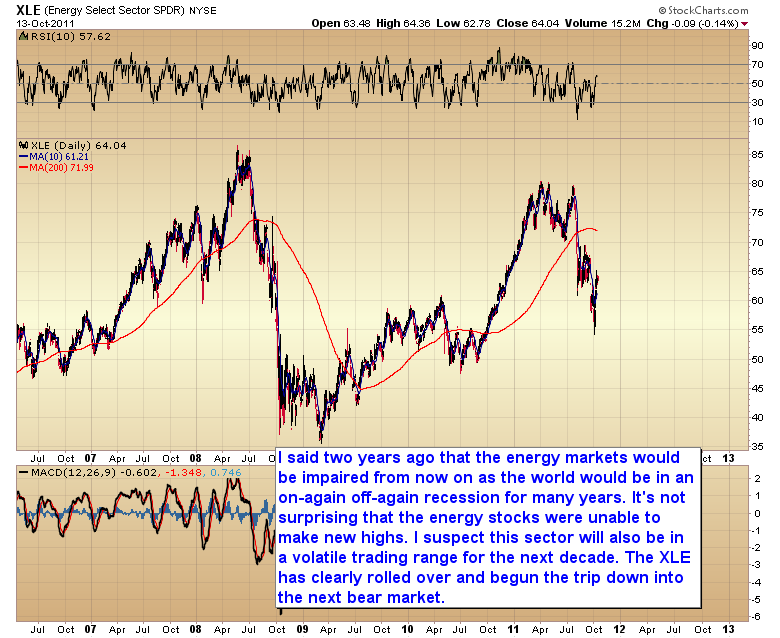 That doesn’t bode well once the cyclical and secular bear trend resumes. 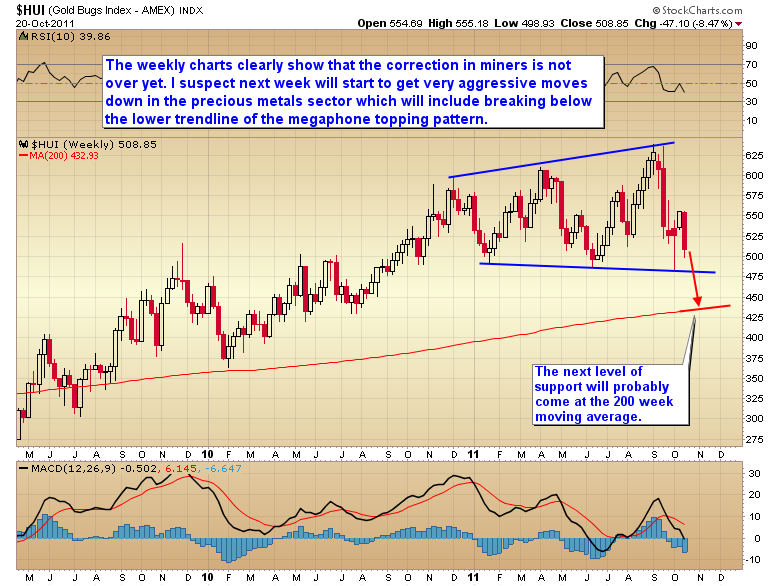 The HUI mining index is now on the verge of breaking down out of the multi-month megaphone topping pattern. 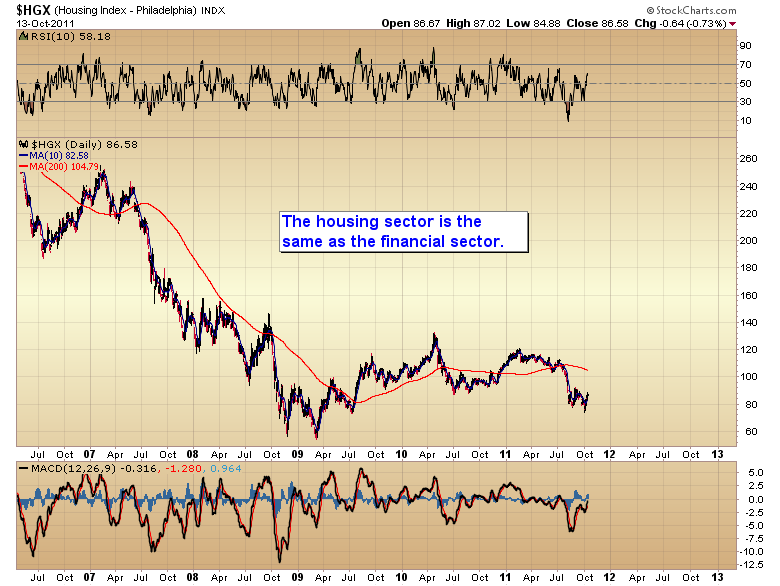 Once it does that will confirm that the bear now has his teeth in the last holdout sector. The sector that led the bull market over the last 2 1/2 years and now the last sector to succumb to the deflationary forces. 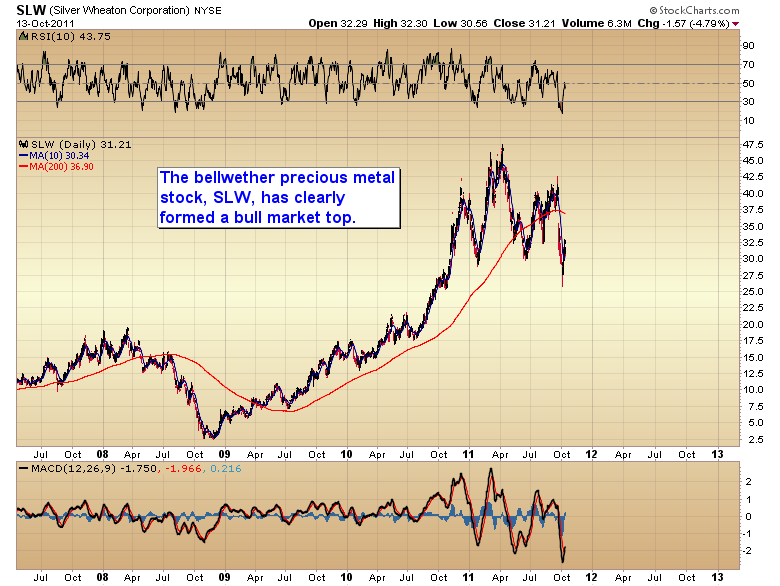 As I have noted in the chart I do expect the miners will find at least temporary support at the 200 week moving average. 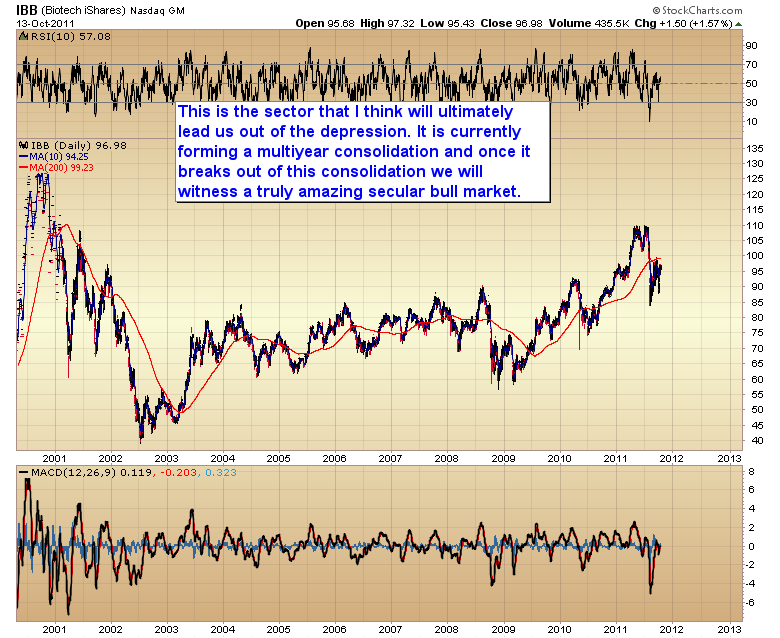 That should correspond with gold putting in an intermediate degree bottom sometime in the next two or maybe three weeks. Presumably it will come with gold below $1535. 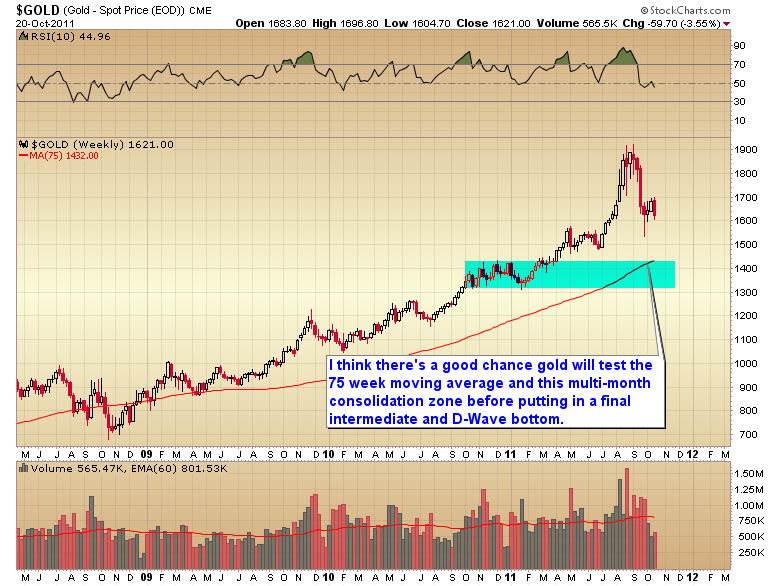 My best guess is that gold will make an attempt to test the 75 week moving average at that intermediate bottom. 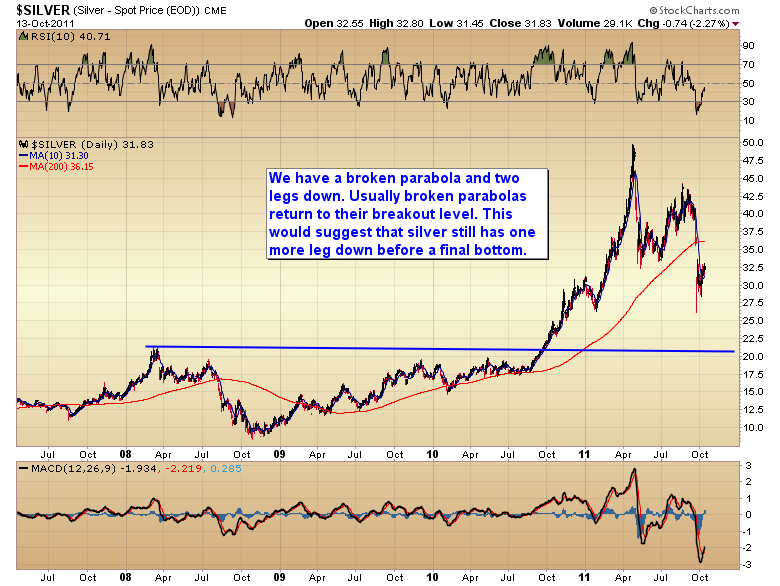 At that point gold should be severely oversold enough to generate a very powerful, snap back, A-wave rally. That should be followed by a multi-month consolidation as gold works off the huge gains of the last 2 1/2 years. 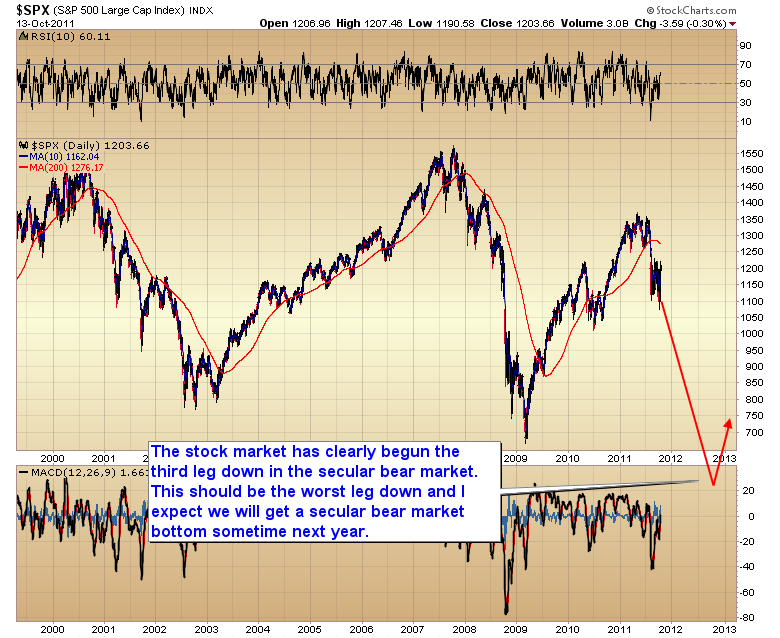 This while the stock market continues down into its final four year cycle low. 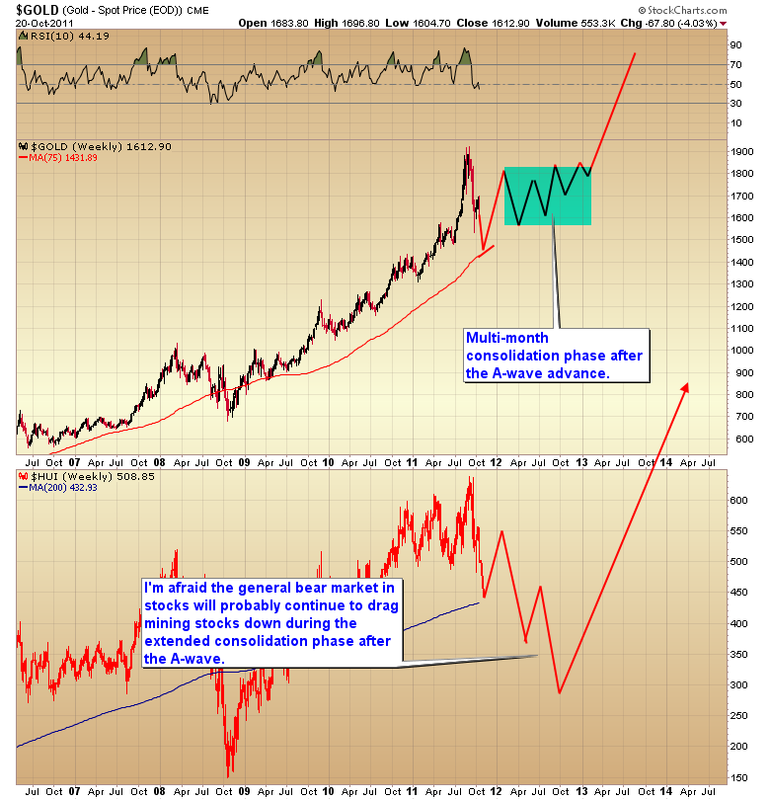 I expect the miners will produce a substantial rally off the 200 week moving average also but I’m afraid they will continue to get dragged down by the general bear market in stocks even if gold does form a high-level consolidation over the next year. So while I expect to see a great buying opportunity on miners in the next few weeks I doubt it will be a long-term type trade. That probably won’t occur until the stock market puts in its final four year cycle low sometime in the fall of next year. 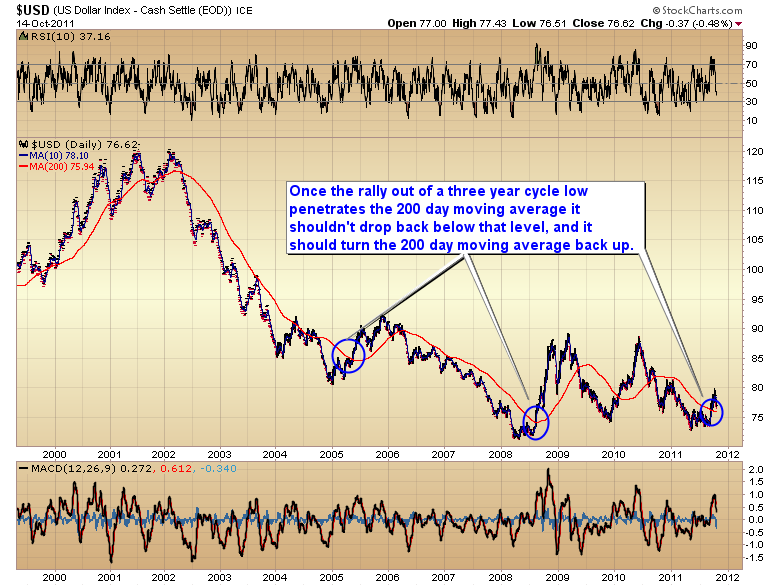 As many of you know who have read my work in the past, the dollar put in a major three year cycle low back in May. It has been my expectation all along that the rally out of that major bottom would coincide with another deflationary period and the next leg down in the stock secular bear market. 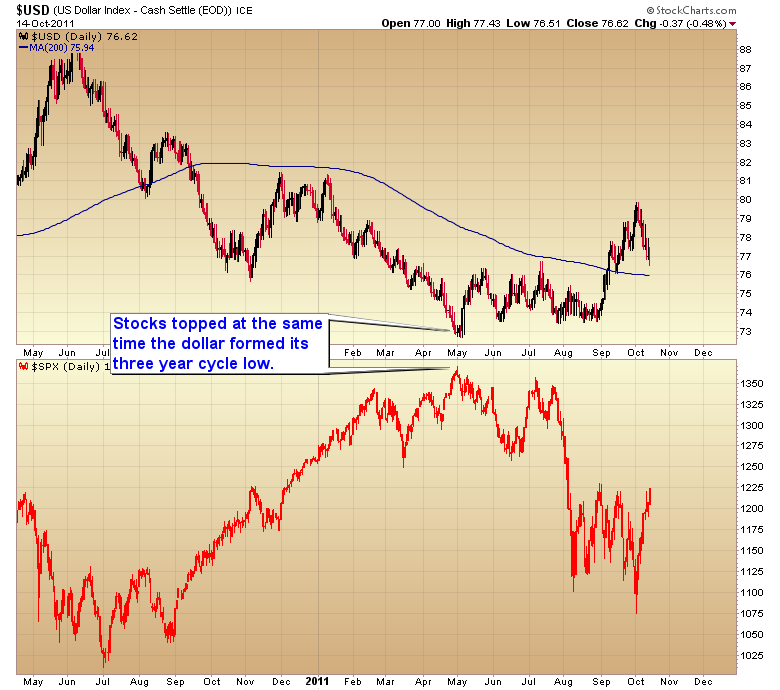 So far this has been the case as stocks topped in May at the same time the dollar bottomed. 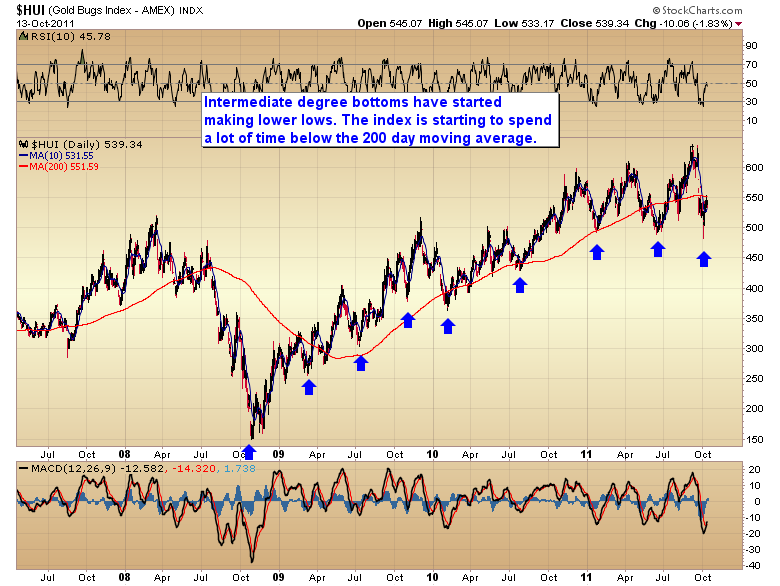 After a 15 week consolidation the dollar has initiated its first powerful thrust up out of that major bottom. As you can see in the chart below the rally out of a three year cycle low generally lasts at least a year and turns the 200 day moving average back up. I’ve also noted that once the rally out of a three year cycle low rises above the 200 day moving average, it shouldn’t dip back below that level, at least not for the next year to year and a half. 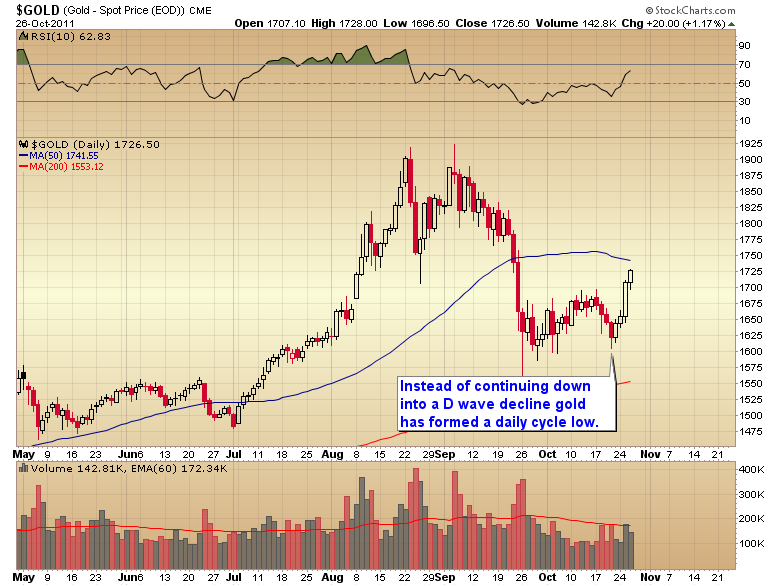 Sometime in the next few days the dollar will put in a daily cycle low and bounce. My expectation is that it will either bounce off of the 200 day moving average or bottom slightly above that level. It’s what comes next after that bounce that is absolutely critical. Bernanke is now about to make the most important decision of his life. 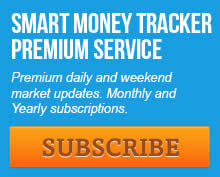 The correct decision is to allow the dollar to appreciate, which in turn would continue to drive the stock market down into its next four year cycle low in the fall of 2012, and would facilitate a much-needed recession to cleanse at least some of the massive debt that has been accumulated in the last two years. That is the correct decision. It is also a very hard decision because it will lead to severe short-term pain and undoubtedly another depression on the same scale as 1932. However if Bernanke chooses to kick the can down the road again and continues his failed policy of monetary debasement then the dollar is at great risk of forming an extreme left translated three year cycle. 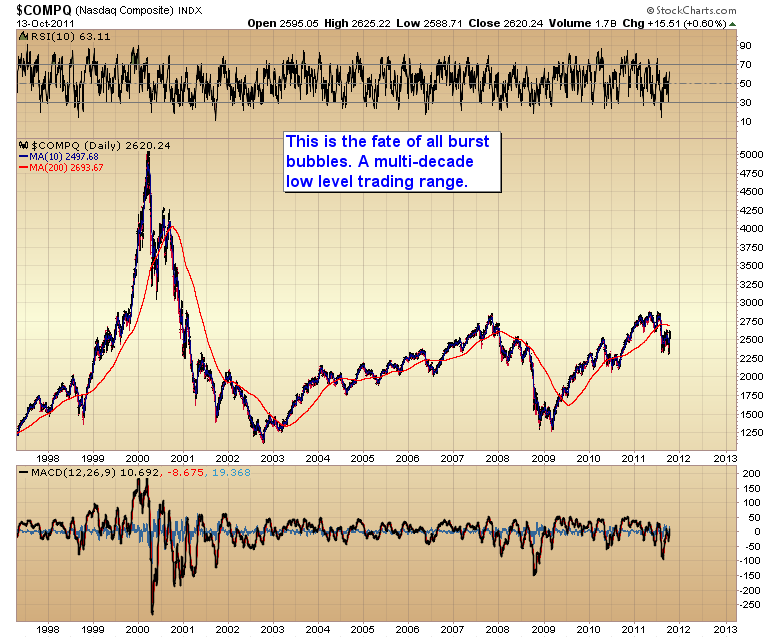 For those of you that are new to cycles analysis, a left translated cycle is generally associated with a bear market. Left translated means that the cycle tops in the front half of its cycle timing band. 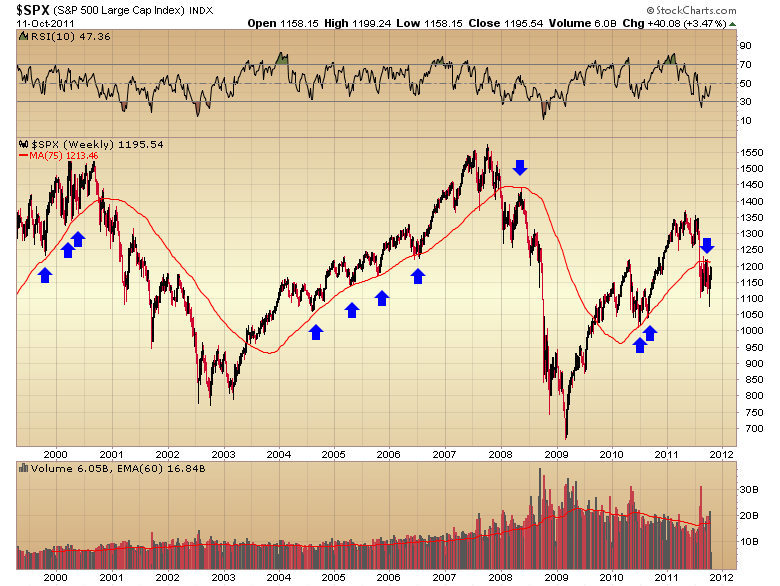 In this case any top that forms prior to 18 months would signal a left translated three year cycle. Furthermore the more extreme translated a cycle is the more severe the decline tends to be, simply because the cycle has a lot more time to move lower. If Bernanke decides to avoid short-term pain and kicks the can down the road again with further currency debasement, then the dollar is at great risk of having already put in the top of this three year cycle. The unintended consequences of a three year cycle that tops in only four months are, to put it mildly, horrendous. That would indicate that the dollar is going to head generally lower for the next three years culminating in a hyper-inflationary event at the next three year cycle low in 2014. The next couple of weeks and months are going to be of grave importance. The dollar needs to find support at the 200 day moving average and resume moving strongly higher. That would of course put pressure on the stock market and probably terminate the current bear market rally somewhere around the 200 day moving average (roughly SPX 1270ish) before the next leg down begins. If however the bounce out of the now due daily cycle low is weak and the dollar rolls over quickly and moves back below the 200 day moving average then all bets are off. Stocks could even rally back to marginal new highs. 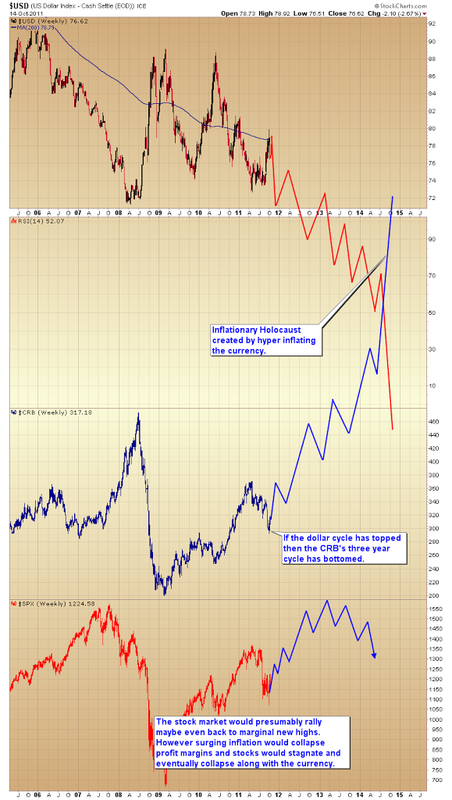 However that would also guarantee that the CRB has put in its three year cycle low and we are now at the very beginning of an inflationary Holocaust. 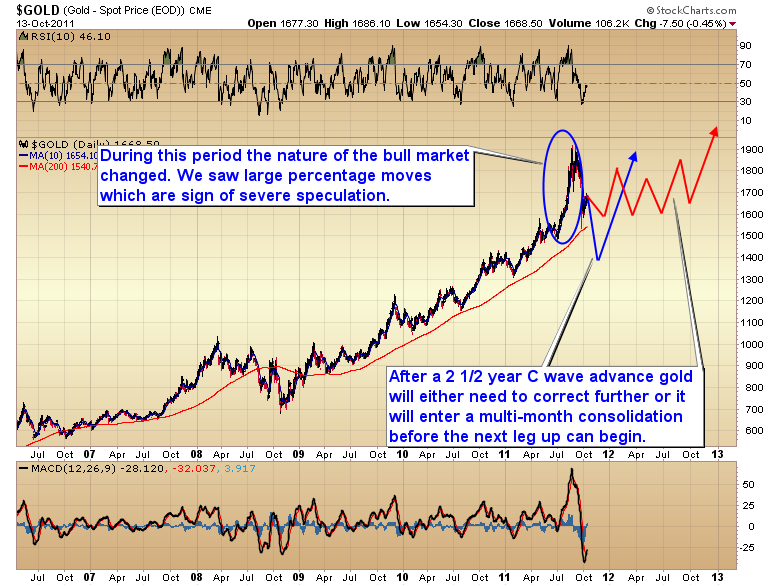 If Bernanke makes the wrong decision then gold is on the verge of moving into the bubble phase of the secular bull market. That being said gold should still experience one more move down in the next couple of weeks as the dollar rallies out of its impending daily cycle low. After that, everything hinges on Bernanke’s decision whether or not to continue his failed monetary policies. This entry was posted in Uncategorized on October 15, 2011 by Gary. More often than not we as investors get caught up in the day-to-day action and never take the time to step back and look at the big picture. 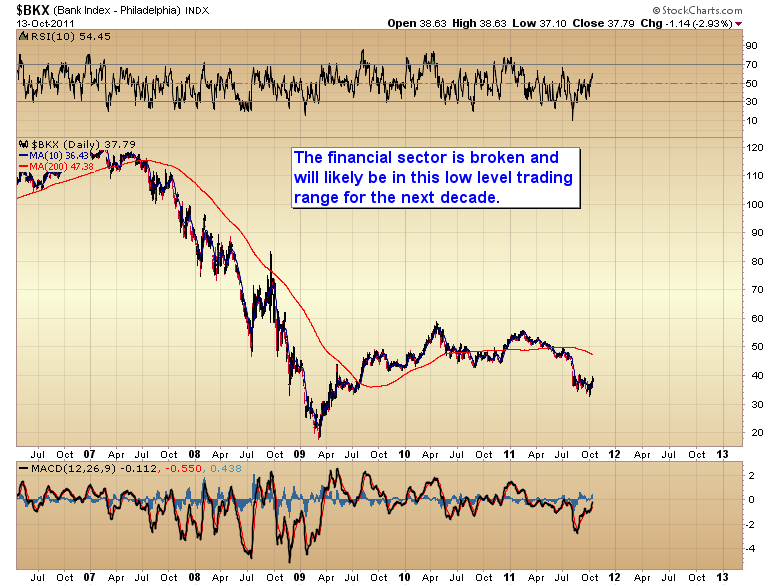 Today I’m just going to post some long term charts with appropriate annotations. This entry was posted in Uncategorized on October 14, 2011 by Gary. The 75 week moving average has been a very clear dividing line between bull and bear markets for the last couple of decades. 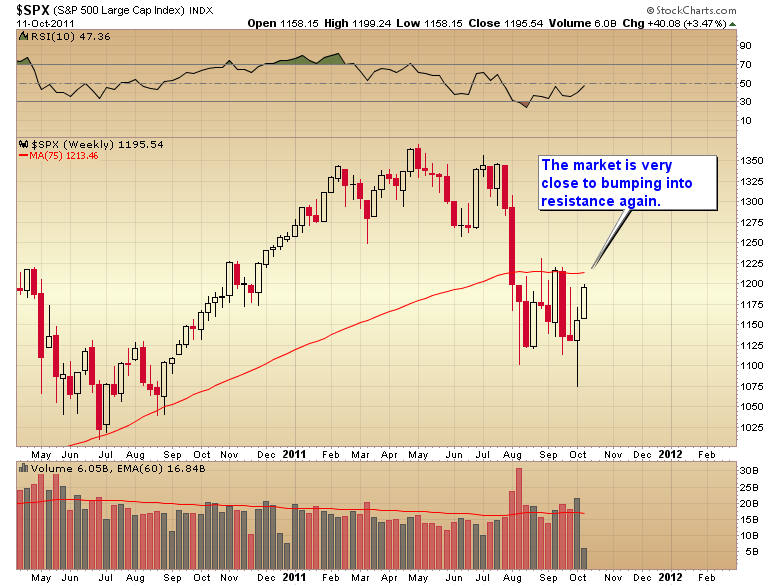 The S&P is on the verge of running in to that roadblock soon. It’s possible that the S&P could penetrate this level briefly, and possibly even rally back to the 200 day moving average (about 1250) before the bear market resumes. That being said I doubt the market will be able to penetrate this major resistance level on the first try, and it may even end up capping this bear market rally. This entry was posted in Uncategorized on October 12, 2011 by Gary. This entry was posted in Uncategorized on October 10, 2011 by Gary.